Pia Wurtzbach ▸ A cryptic quotable from Pia Wurtzbach, is she over Dr. Mike? | A cryptic quotable from Pia Wurtzbach, is she over Dr. Mike? 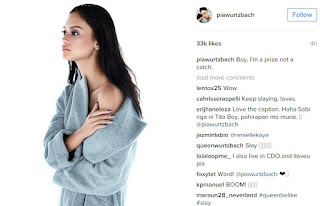 | A cryptic Quotable from Pia Wurtzbach, is she over Dr. Mike? 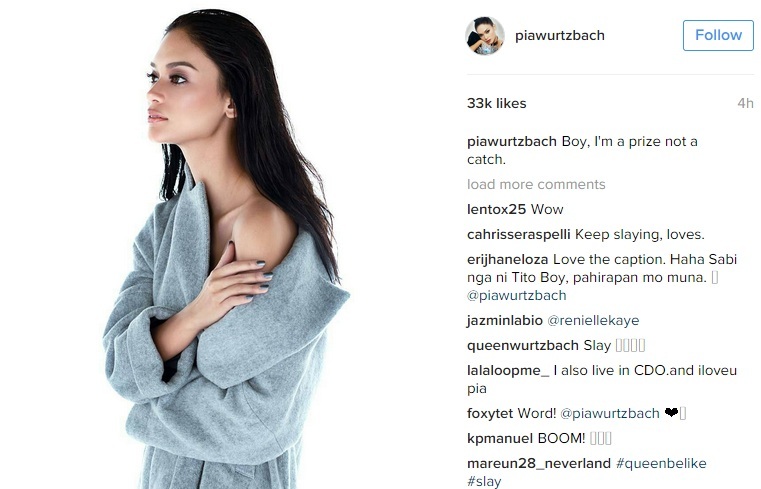 A cryptic quotable from Pia Wurtzbach, is she over Dr. Mike? Miss Universe Pia Wurtzbach is known for her wonderful, quotable answer during the 2015 Miss Universe Pageant. She is known for the phrase "I am confidently beautiful with a heart." Boy, I'm a prize not a catch. The message accompanied a photo of the beauty queen in a robe-type dress, with her right hand touching her bare left shoulder. She was rather serious in her look, half exhibiting that fierce look which she is also known for. Her millions of followers instantly reacted to the post and within 5 hours, the post earned more than 40,000 likes and more than 270 comments. Pia's twist of the descriptive phrase "prize catch" hints of sarcasm, something which her followers didn't miss. A lot of them commented that it must be directed to none other than Mikhail Varshavski or Dr. Mike, the handsome doctor that Pia is dating. Some commenters are speculating that the "relationship" must be on the rocks or even over, because the message is a "hugot" line. Others are saying that Pia wants Dr. Mike to work hard to win her heart. Followers describe Pia as a rare gem, a treasure worth keeping . So, Dr. Mike has to fight for Pia, if he really wants her. The last social media post of Dr. Mike about Pia was when he tweeted a photo of him and Pia inside a chopper, with the caption "Helicoptering around #nyc" in April 26. He also posted a picture of them on Instagram, probably taken on the same day, while they posed at a helipad. But observant IG followers had also noted that Dr. Mike deleted his first date picture with Pia. A lot of them are wondering, what's really going on with the two. Are they still dating or not? Home » Pia Wurtzbach » A cryptic quotable from Pia Wurtzbach, is she over Dr. Mike?